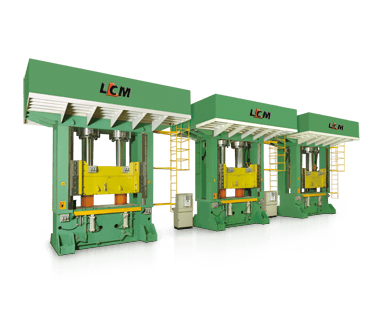 Lien Chieh Machinery (LCM) has developed a wide assortment of different Press Machines for many different applications. This includes High Speed Presses, C-Frame Hydraulic Presses and also specialized SMC Presses. SMC Press Machines are widely used in the aviation, automobile, construction and energy industries for the precision manufacturing of parts and components. We can custom manufacture all our Press Machines for specific applications while meeting all the technical requirements of our customers. Besides SMC Press Machines, we also offer specialized GMT, BMC and Fibre Cement Board Presses. With over 65 years of manufacturing experience, LCM is able to manufacture Press Machines with exceptional precision, expert fault monitoring systems as well as very low sound levels below 83dB. Furthermore all of our SMC Presses can be equipped with multiple openings, safety light curtains and intelligent leveling systems to ensure precision manufacturing at all times. As we have been manufacturing Hydraulic SMC Presses and other Hydraulic Presses for many years we truly understand what our customers’ value most, and this shows in the designs of our machines.